The idea of "making a deal with the devil" has taken on a great number of incarnations, but no Fasutian bargain could outdo the morally ambiguous protagonist in "Never Bet the Devil Your Head." The story's narrator, who only acts as an observer in the tale, tells us about an immoral guy, aptly named Toby Dammit, who is riddled with a litany of vices, including a penchant for gambling. Toby's obsessive gambling escalates to the point that he begins betting on minor incidents, and in lieu of wagering money, instead takes to saying, "I'll bet the devil my head," putting his neck on the line for meaningless bets. 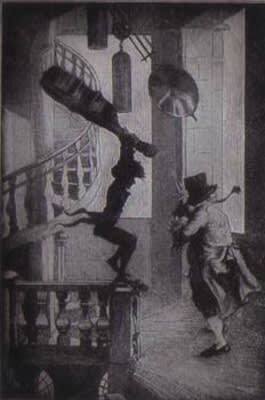 One day, the narrator is traveling with Toby and he bets the narrator he can leap over a turnstile in the distance, and bets the devil his head he can clear it. Suddenly, a "little lame old gentleman of venerable aspect" appears and urges Toby to make the jump. Toby takes the jump, falls backwards mid-leap, and the old man hobbles up to his fallen figure and runs away with something. The narrator finds that Toby has been beheaded by a metal bar that was right over the turnstile, but his head is nowhere to be found. This satire is Poe's response to critics who, at the time, condemned his writing as amoral. While the story's original subtitle, "A Tale With a Moral," seemed to denote it as a direct response to those claims, the subject matter dismisses the argument that literature should have moral responsibility.